We joined our local CSA last Spring and although I don’t always make it through all of the lettuce and I occasionally lose some vegetables in the back of the fridge when it gets full and we’re busy and I’m not cooking as much I’d like, we’ve really enjoyed picking up our weekly box of goodies and I’m happy to support our local organic farm, T&D Willey Farms, here in Madera, California. It’s been a while since I shared the contents of our CSA box, so I thought I’d let you peek inside and see what’s growing around here in November. Today’s haul: Tuscan Kale, Mei Qing Choi, Asian Turnips, Autumnal Lettuce, Yellow Onion, Nantes Carrots, Baby Dill, Sweet Green Pepper, Fuyu Persimmons, and Bosc Pears. Our box is the small size, but there is the option of a family size box which would have more of everything plus an extra item or two (today’s family box would have included Fuji Apples as well). 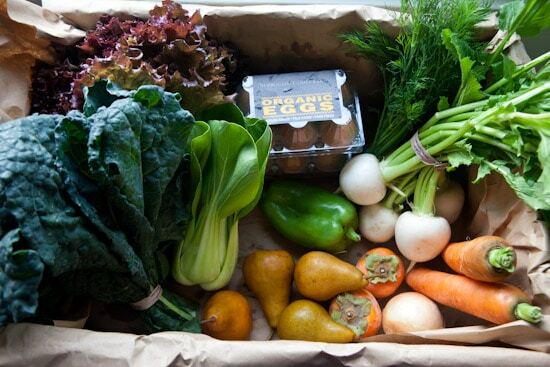 Our box of produce costs $15/week. We pay extra for a dozen organic pastured eggs each week, which come from Burroughs Family Farms. We have the option to order extra produce from the Organic Abundance list that’s included in the weekly CSA newsletter. So if I decided I wanted to purchase several pounds of apples to make pies or apple butter or to juice, I could place my order this week and a box of local, organic apples would be waiting for me with my next pickup. The Organic Abundance list is quite extensive and I love having the option to order something extra if we want. This month’s options include: Bosc Pears, Fuji Apples, Delicata Squash, Hachiya Persimmons, Fuyu Persimmons, Pastured Organic Eggs, Nantes Table Carrots, Juicing Carrots, Winter Savoy Spinach, Arugula, Eggplants, Yellow Onions, Lettuce, Shelled Walnuts, New Harvest Brown Rice, Pistchios, Olive Oil, Raisins, and Currents. Lots to choose from! The newsletter that is included with each weekly produce box is a wonderful resource. Recipes are always included so you have an idea of what to do with your vegetables for the week and specific storage instructions are given for each item to ensure that everything stays fresh until you are ready to use it. I seem to learn something new every time I read the newsletter and the recipes look so good that I’ve never been able to throw one away. Are any of you currently members of a CSA? If so, what’s in your box this week? Just unloaded this week's csa box, same as yours. Next week's box will be fun as they always give us Thanksgiving meal prep goodies. We got a CSA box last year (we were gone much of the summer this year) but because of where we live there are much fewer crops grown and our "season" is only Jun 1-September 15. But we liked it. I buy eggs weekly from a local gal. That's a great deal for the price, looks fantastic! I also get a CSA box in AZ. Like BrendaLou, we have a limited season too. So my box which I pick up weekly, contained this past Friday, fennel, zucchini, 2 different types of lettuce...arugula for sure, two types of kale, fennel and beets. I had never used fennel and so I took the easy way out which was to cut it into strips and add to a salad. My greatest fear is that I won't use each item. So, I am subscribed to several cooking blogs to keep me in the know and inspired. I wish we'd get some beans, or faro, or tomatoes. I'm happy to get what we have been and we'll see what happens in January thru May, after which the weather will be crazy hot. Hi Nicole, I think a csa is great, especially is you aren't able to have your own garden. It's like getting a little surprise gift every week - so cool. I noticed that you mentioned spoilage that happens sometimes when your fridge is full or you are really busy. I came upon this little product that extends the life of all the food in your refrigerator by adding oxygen into it. It is a small, battery operated device called Berry Breeze. I don't know if you've heard of it - I have a little write up about it on my blog (healthyandfitwoman.com) under products I recommend. I think they are great for all of us who feel soo bad when food (especially vegetables and ftuit) spoils in our fridge. Just thought I'd pass it on since I think most of us run into this problem and really don't want to waste our precious goodies like we get in our csa boxes. We had a CSA share several years back and I'd love to do it again- but not a share. I think we were stuck with the half our partners didn't want- lots of radishes and random greens. I love the idea though- and I do shop at our local town farm whenever they have veggies for sale. Your CSA box looks amazing and such a variety! I love eatting as many raw vegetables as possible and I always buy organic ones. I simply love spending time in the kitchen preparing raw foods. Our CSA box looks a lot like yours, such good stuff (and thank heaven, no kohlrabi or swedes so far!). We share with a friend -- instead of splitting a box like Renee above, we go every-other-week, and get the whole box (and then give away the kohlrabi :-) It's still a LOT of veggies for one small family, though. My fridge is overflowing with Collard Greens!